The Flight Saddle stool is the newest product to be added to the Flight family of operatory stools. The saddle stool is a multi-purpose stool that is appropriate for dental, medical, podiatry, ENT, beauty, spa, tattoo, veterinarian, lab, technical and office use. 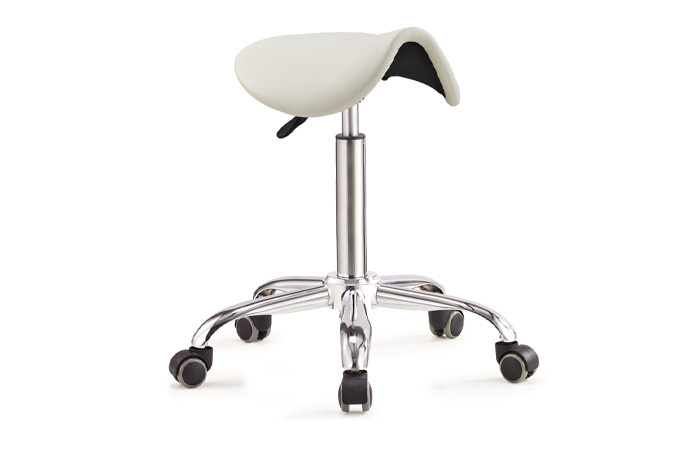 Saddle stools are very similar in look, design and feel as an equestrian saddle. The saddle design for seating comes with a pneumatic gas cylinder to allow the user to adjust the correct height to reach the optimal angle of 135 degrees between the hips and knees. On traditional chairs your hips and knees are typically at a 90 degree angle causing most people to naturally slouch or hunch over and over time this can lead to chronic shoulder and back pain. A 135 degree angle promotes proper posture and allows your spine to be in a healthy lordotic curved position that helps to reduce the pressure and stress on your spinal cord and to create a stronger core. It has been clinically proven that the use of a saddle stool is able to build muscle as the stool forces the user to sit up straight thus building both your upper leg, buttocks, abdominal and leg muscles. The proper way to sit in a saddle stool is at a 135 degree angle with your legs spread out in a way called hip abduction to stabilize the pelvis in an upright orientation. This sitting stance helps to improve balance, hand acuity and strength over time. However, the user typically sits in a higher position and must adjust its work surface to a higher height as well.